The last article in the ‘Analyse A Real PPC Campaign’ series to have been analysed was by The Protein Works, who appeared to have one of the best landing pages I have seen in the series for a long time for a number of reasons (which I go into detail about in the article). However, having a standard PPC search advert competing against adverts displayed using Google Shopping question show high a click through rate The Protein Works is actually achieving since they cannot compete using numbers like Google Shopping adverts can. The first thing I look for is the reason why BMW have made a bid for their own brand name. They rank organically number one and have a range of extra links organically too. But, the important thing with this advert is that the site link extension has different links as compared to the extra links organically. This means a possible reason they made their advert was to display different site links other than the ones on the top organic result. Looking at the advert itself, it is great since it encourages the web user to explore BMW with the two call to actions in the description. 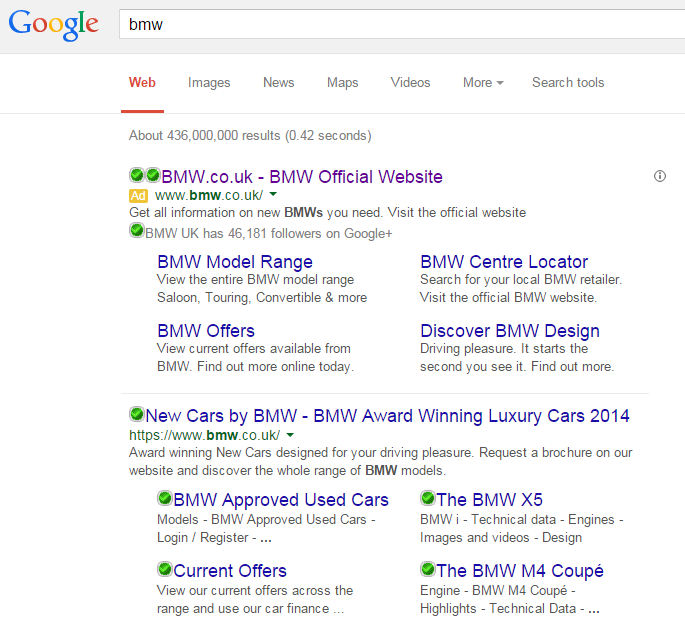 The site links enables this to happen so all in all, it is a great advert based on what BMW wants the web user to do. The centre stage of the landing page is taken up with a beautiful slideshow of the different cars have to offer. Images always work well on landing pages. There is a great floating navigation menu at the top which enables the web user to click onto any of the cars BMW makes to find out more information about it. The buttons are large and clear which will help achieve healthy CTRs. There are four images that half appear at the fold. This encourages the web user to scroll down below the fold of the landing page to find out what the images are about. Ultimately, BMW had the goal of enabling the web user to find out information about their cars. From using site link extension and by having a well designed landing page that gives the web user access to any one of the cars BMW makes illustrates that they have made a great landing page that will help promote the whole BMW brand and inform web users of the cars they have for sale.